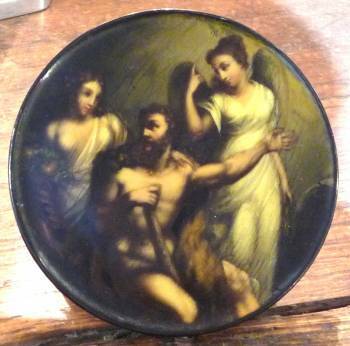 Papier Mache painted with a scene inscribed under the lid: "Herkules am Scheidewege nach Ender". Inside the base inscribed: "10633" & "Stobwassers Fabrik". The scene an allegorical representation of the choice between Vice & Virtue. The two female figures often as Venus & Minerva, 'though here the winged figure gesturing heavenward is more likely an angel. See "European & American Snuff Boxes, 1730-1830", p. 81 for an account of Stobwasser & Illustrations # 684 & 685.